Guests at Heritage Resorts can take advantage of Heritage Golf Club’s offers to improve their swing during their vacation at the Domaine de Bel Ombre. Attention to all golf fans! Wonderful landscapes, championship golf course and PGA certified instructor: the ideal conditions are met for you to advance your game. 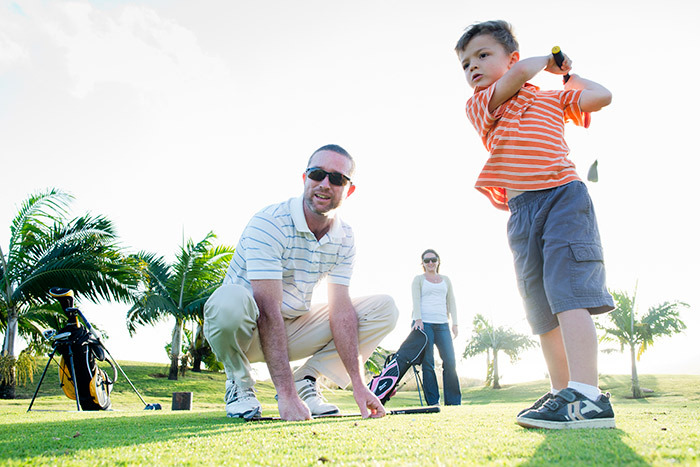 Heritage Golf Club offers customized packages to guests who wish to learn and improve their swing. They can choose between initiation courses to try a new sport, one-hour sessions to emphasize on specific technical aspects or true golf vacation to fully live their passion, with an instructor at their side. There is a package for every need and taste. Mathieu Millet is a golf instructor at Heritage Golf Club. Member of the French PGA, he holds a State pro license and has over eight years of experience including at the well-known Dominique Larretche and David Leadbetter academies. He is dedicated to helping guests improve their game. Golf initiation courses for children at the Junior Academy. Furthermore, weekly sessions are available to all amateur players: free practice for ranked players or a tour of the compact 9-hole course. The Junior Academy provides golf initiation courses for children between 6 and 14, introducing them to this demanding sport at a young age. Heritage Golf Club offers the most incredible golf experience in the Indian Ocean based on its numerous technical assets. 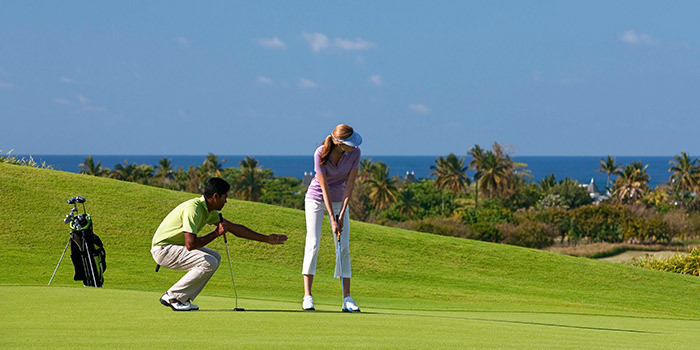 Rated as the best golf course in the Indian Ocean at the World Golf Awards 2014, it meets the expectations of golfers of all skill levels with an 18-hole championship course and a 9-hole pitch & putt course ideal for junior players and beginners. Designed by architect and ex-European Tour professional Peter Matkovich, Heritage Golf Course features amazing views on the lagoon and Frederica Nature Reserve. Set in the midst of luxuriant flora and prolific fauna, including protected bird species, deer, monkeys and wild boar, it will delight not only golf enthusiasts but nature lovers also. This year, the Domaine de Bel Ombre, and most particularly the Heritage Golf Club, will be at the centre of an international golf event. The Afrasia Bank Mauritius Open, which will take place from May 7th to 10th, will bring together three of the major international tours – the Sunshine Tour, Asian Tour and European Tour – for the first time in golf history. It is a huge event to look forward to! Named after a legendary couple of Mauritius, Veranda Paul & Virginie – Veranda Resorts’ Adults Only hotel – promises its guests a romantic escape in a serene setting. Embark on a canoe to explore the lagoon. 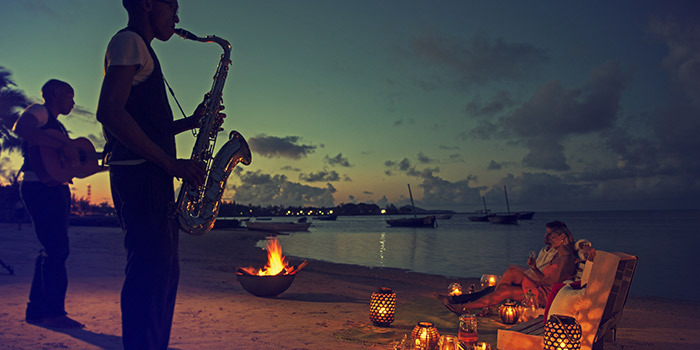 Watch the sun set from a “love nest” on the beach. Enjoy an intimate al fresco dinner to the sound of romantic music… Just an idea of what awaits Veranda Paul & Virginie’s guests during their stay! Children are not admitted in this Adults Only hotel, dedicated to couples that seek an intimate and quiet retreat. The serene atmosphere allows for relaxation and magical moments. Veranda Paul & Virginie offers a large choice of activities for all tastes: relaxing and indulging a massage for two in the cosy and private setting of the hotel’s Seven Colours Wellness Spa; enjoying culinary treats with a mouth-dropping view on the ocean; discovering Mauritian culture… or meeting on the beach for a sundowner in a fleeting lounge bar ambience! The hotel is ideally located in the quaint fishing village of Grand Gaube on the North coast of the island and at a 15-minute drive from the vibrant city of Grand Baie and its numerous restaurants, bars, shops and excursions. Jennifer Wong, the hotel manager and a well-known figure of the Veranda Resorts brand, aims to make Veranda Paul & Virginie the reference destination for couples in Mauritius. As a matter of fact, the hotel became Adults Only on November 1st, 2014 to best meet the targeted clientele’s expectations. Moreover, Veranda Resorts now provides wedding planning services and offers to organise all-inclusive weddings, renewal of vows and symbolic ceremonies. Is there a better place to celebrate love than one of the most romantic hotels on the island? The Adults Only option is a pledge of tranquility for couples that wish to reconnect to one another during their stay. The exotic backdrop of Grand Gaube village and the romantic atmosphere of the hotel contribute to its undeniable charm and to the promise of a dream vacation.